One of the fastest ways to start enjoying the benefits of free energy from the sun is by installing a “off the shelves” solar panel on the roof. However, fast does not mean cheap. Usually it is the opposite. If you want a low cost way to own a home solar power system, you may have to make the solar panel on your own via Do It Yourself (DIY) approach. That will take some time and commitment to complete the project. If you want to get the residential solar energy system up and running within a week, take out your credit card and head over to Amazon.com to do some shopping. Do you know when we are impatient, we tend to make stupid buying decision? Yup…that happened to me more times that I can count. When you’re shopping for solar panels for your house, here are 5 tips to help you to make a good decision. Does the price quoted comes with shipping charges? The Photovoltaic panels can be quite heavy and bulky. Make sure you check with the sales clerk the transportation costs are added. If not, find out how much shipping charges you will have to pay. 2) What is the power output? Check the power output of the solar panel when it is under direct sun light. Here’s a question you may want to consider. How much power do you need from your home solar power system? 50, 80 or 100 watt? From experience, a solar panel with a maximum power output of 80 watts and approximately 5 amps is a good starting point. 3) Is it easy to install? Make sure the solar panels have everything you’ll need for the installation. You will need all the screws, bolts and nuts, brackets etc. If you don’t want the hassle, call a local contractor to do the installation for you. It will be money well spent. 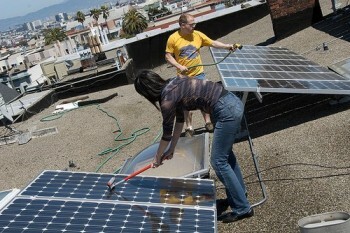 You don’t have to endure the back breaking task of hauling the solar panel up the ladder on to the roof. And there’s no risk of you falling off the roof also! 4) Warranty, warranty and more warranty. Since the solar panel will be left on the roof, it will be exposed to sun, wind, rain and snow. Make sure it has good warranty coverage. You want to have a good Return On Investment (ROI) for your purchase. Most solar panels will have product warranty up to 25 years. Make sure the one you’ve selected has it too. 5) Not from China please! Buyer beware! From my personal experience, goods from China may be cheap, but they are usually more expensive when you use it. It breaks down way too fast. For a solar panel to lasts, it has to be made with a certain degree of quality control. If you want a long lasting solar panel, try to get one that is made from either Germany or Japan. A good brand would be from Sharp Corporation. They are the world’s largest manufacturer of high quality commercial and residential solar panel. I have heard a lot about using solar energy but this is first but this is first time I am reading something interesting on shopping for solar panels..thanks for it and I suggest everyone should read this. I am very pleased to get this kind of information from someone who knows what they are talking about. Most people out there wont give you the time of day.THANKS.